On my recent trip to New Orleans I had a ‘Grasshopper’ cocktail at the bar that it was invented in. 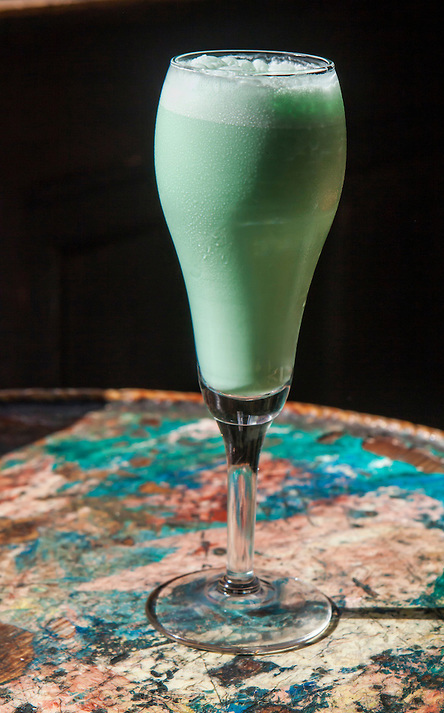 I was in Tujagues Bar in the French Quarter where, in the 1920s, the owner Philbert Guichet threw together equal parts green Crème de menthe, white Crème de cacao and cream to create the now famous cocktail. Philbert entered the drink to a recipe contest in New York in 1928 and was awarded second place, but it didn’t become popular until the 1950s when the sweet drink became the housewife’s favourite at cocktail parties. There is some conjecture, but the folk of New Orleans will tell you that the cocktail was actually invented in the city. The story goes that a fellow named Antoine Peychaud opened an apothecary shop (an old school type pharmacy) in the French quarter in the 1830s where he also sold his own homemade bitters. He then figured out one day that if he mixed it with cognac, sugar and water the bitters not only tasted better, but it gave you a nice buzz that plain old bitters couldn’t. He measured out this concoction with an egg cup (called a coquetier in French – some believe this is the basis for the term ‘cocktail’), and so the modern cocktail was born. New Orleans is actually home to quite a few cocktails, including the Sazerac (another drink concocted in a pharmacy), the Hurricane (and no, not the Katrina variety) and the Ramos Gin Fizz. I tried them all on a ‘Pub Ghost Tour’ – which was basically an excuse to drink a lot with a few ghost stories in between the drinking. Cocktails (and alcoholic drinks in general) seem to taste better when you drink them in their country of origin. I’ve had a Pisco Sour in Chile, a Blue Hawaii in Hawaii, a Margherita in Mexico, a Manhattan in Manhattan and a Caipirinha in Brazil and they all were just that more exotic. When my American sister-in-law was giving me travel tips about New Orleans she told me to keep away from the Hurricane cocktail because of it potency and somewhat dubious ingredients. 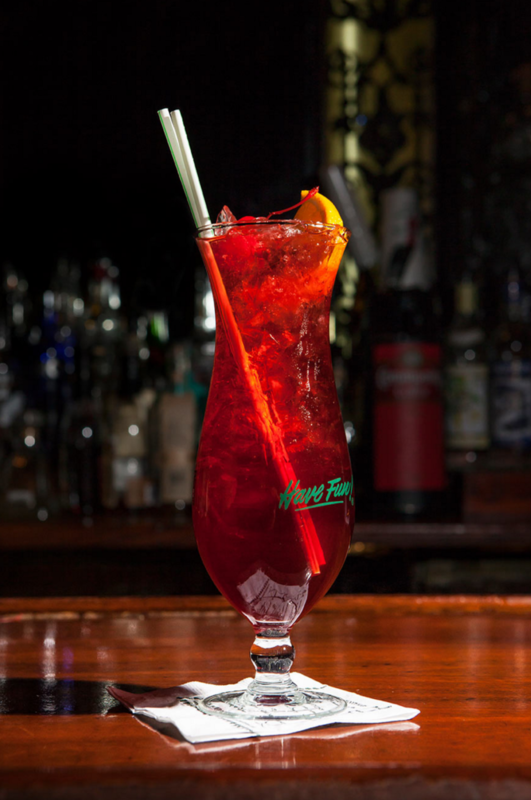 Legend has it that the owner of Pat O’Brien’s bar (who just happened to be called Pat O’Brien) wanted to get rid of cheap rum as quickly as possible, so he made the Hurricane with lots of juice to mask the flavour and sold it in giant hurricane lamp-shaped glasses. That didn’t stop me from trying one from the original Pat O’Brien’s, though. The Hurricane was massive and was so sickly sweet that it was like drinking lolly water. That would help explain the parade of legless folk I saw every night wandering around Bourbon Street with large plastic cups of Hurricanes. 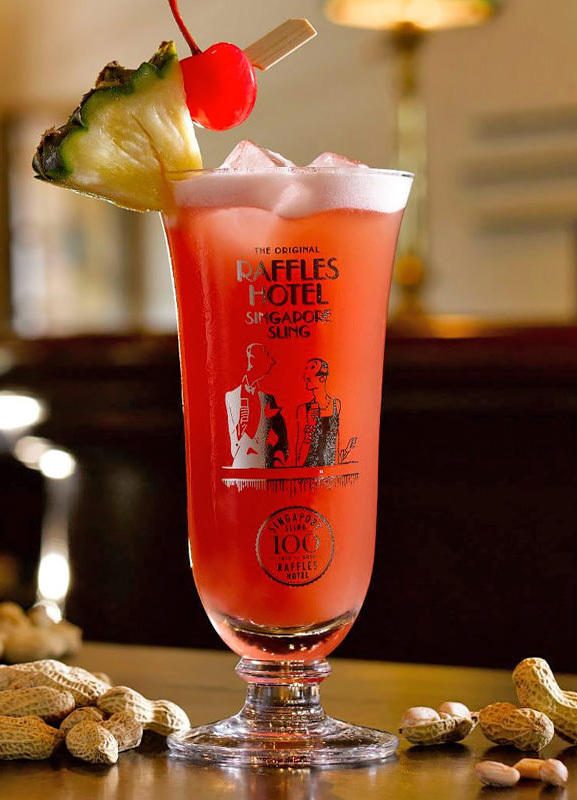 You can’t visit Singapore with going to Raffles Hotel and you can’t go to Raffles hotel without spending a fortune on a Singapore Sling at the Long Bar. I did one better and stayed at Raffles (with our own butler no less), so at least I didn’t have far to stagger from the bar. The famous cocktail was developed in 1915 by Ngiam Tong Boon, a Chinese bartender working at the Long Bar. I only had one, though. That’s because one Singapore Sling is just under $30. However, the peanuts are free. At around $25 a (small) glass it’s an expensive drink, but you are having the original Bellini – and you get an amazing view of the Grand Canal. Giuseppe Cipriani, the founder of Venice’s Harry’s Bar, started mixing up the peachy little drink in the 1930s. The pink drink reminded him of the colour of a saint’s toga in a painting by Italian Renaissance artist Giovanni Bellini, so he named his concoction in honour of the painter. 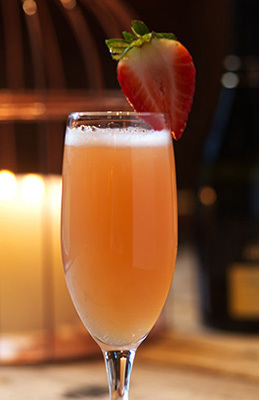 The Bellini was a favourite drink of folk such as Ernest Hemingway, Alfred Hitchcock, Woody Allen, Charlie Chaplin and Orson Welles (who could all afford to buy more then one). 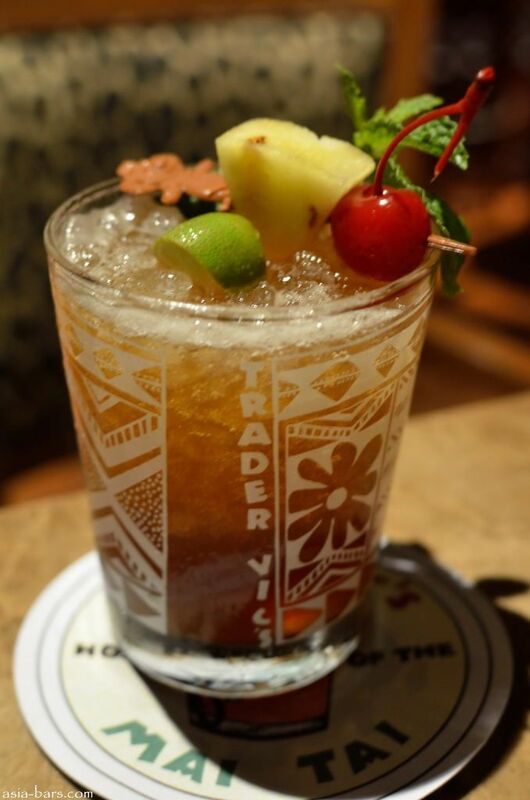 The original and quintessential Tiki drink Mai Tai recipe was created by Trader Vic restaurant and bar owner Victor J. Bergeron – where it contained a very specific 17-year old Jamaican J. Wray Nephew rum. Trader’s Vic may have moved to the Beverly Hills Hilton, but I consider that close enough to being the home of the Mai Tai. I actually had my first Mai Tai in Hawaii at a ‘$1 Mai Tai Karaoke night’ – and my second and third and fourth. I don’t remember much after the fifth. Oh, except when I fell off the stage trying to sing Twist and Shout. Have you had a cocktail in the bar or country of origin? The Top 10 graveyards in the world. Getting whipped and other massages around the world.